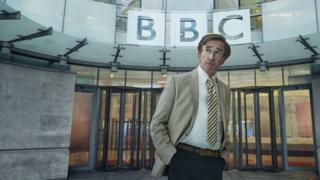 Alan Partridge is returning to live TV as the host of a weekday magazine show - 25 years after making his BBC debut. This Time with Alan Partridge sees him stand in as the co-host of an evening programme that has more than a few similarities to the BBC's The One Show. It's described as a "heady mix" of consumer affairs, news, "highbrow interviews and lightweight froth". The character, played by Steve Coogan, last fronted live TV in the 1990s with chat show Knowing Me, Knowing You. The fictional show was brought to an end when Partridge accidentally fatally shot a guest live on air. Filming on This Time with Alan Partridge started on Monday. The BBC said: "This Time is the perfect shop window for a man of Alan's gravitas and will - or should - see him finally recognised as one of the heavyweight broadcasters of his era." They added that the agenda was "very much the sweet spot for a man whose CV boasts over two decades of weekday local radio". "With an array of diverse subjects on the agenda, it promises the perfect fit for a man whose broadcasting style has been described as 'equidistant between chitchat and analysis," the Corporation said. As with The One Show, which sees a male and female host on the sofa discussing the stories of the day, Partridge will be joined by co-presenter Jennie Gresham. She's played by Susannah Fielding, who's appeared in Black Mirror, The Great Indoors, The C Word and Doctor Who. Tim Key reprises the role he played in Alan Partridge: Alpha Papa - although this time, instead of being Sidekick Simon he's billed as Simon Denton. While it seems similar to The One Show, fronted by Matt Baker and Alex Jones, filming isn't actually taking place at the BBC itself. The One Show's eclectic format has been commented on recently, with a flabbergasted Mel Brooks calling it "nuts" when he was a guest. The six-part series, written by Coogan alongside Neil Gibbons and Rob Gibbons, is to be shown on BBC One later this year.